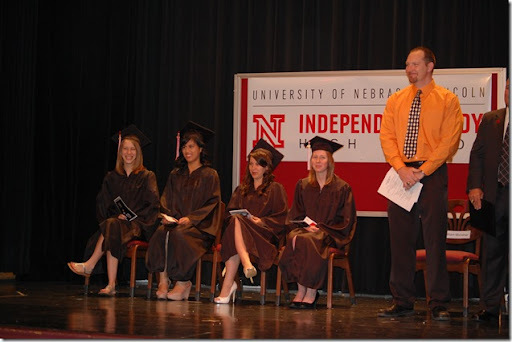 The Admiral graduated from the University of Nebraska Independent Study High School (ISHS) last Friday. It was the road less traveled, but definitely worth the extra effort to get the classes and academic challenges she wanted. With her SAT scores and GPA, she scored some very nice scholarships to a private Catholic university and is well-prepared for the rigors of college-level work. When I started out looking at home schooling options several years ago, my biggest concern was finding a curriculum that was truly challenging and balanced. There are a lot of programs out there and the marketing language is…squishy. When I stumbled across the notion of university-sponsored programs, I was delighted. These schools have an inherent interest in producing qualified graduates and are putting their own reputations on the line. Another benefit is that these programs are all accredited and issue their own diplomas — no need to take a GED exam. 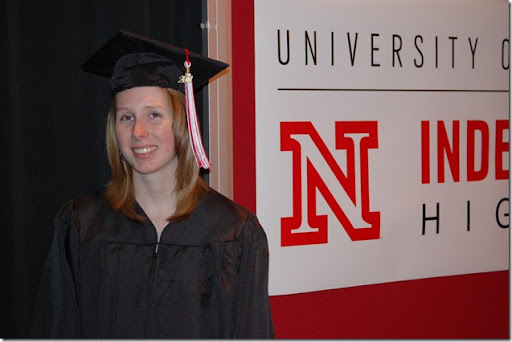 I looked closely at university programs in Indiana, Texas, and Missouri before settling upon the University of Nebraska. All of them have an excellent curriculum and I strongly recommend them to anyone considering homeschooling as a substitute or supplement for local public school education. 160 kids from all over the world graduated, but only four could show up in person. The distance-traveled winner is the young lady second from the left: she came all the way from the Phillippines. The local Filipino community turned out in force to cheer her on, which was touching. The University did a very nice job in providing a commencement ceremony with all of the trimmings, and it was great to finally meet the staff and teachers in person. I have to particularly thank Debby Bartz, the academic advisor, for her continuing excellent advice and — ok, I’ll admit it here — talking me in off the ledge at one point.